Today is the day a half laptop, half smart-phone, all PR blitz shoved the State of the Union off the front page and sent Apple fan boys and girls running for their credit cards. The iPad has dominated the twitointerblogsphere all day. 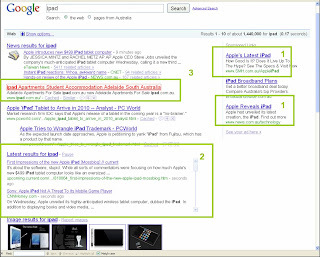 Desperately looking for a different angle on the story I was interested to look at the Google.com.au search results for "ipad". Below is a screen shot. Three very interesting things you can see from it. 1. Look at who is bidding on the term ipad. Two competing news outlets have bid on the term and are paying Google to drive traffic to news stories about the ipad. This is interesting first because I have not heard of a news company buying keywords before. Secondly the speed in which they put together the campaign. Presumably it was planned ahead of time and executed very early Sydney time. 2. Look at what is dominating the search results. The middle area is not links to two or three static websites. Instead there is a scrolling twitter feed updating every part second without the site having to refresh. True real time search integration. I saw this a few weeks ago for the first time with the "latest result" feed matching those search terms trending high on twitter. I like it but missing is the authority element to help determine which tweets/real time updates should be read. 3. Look at who is number one for search results and loving the traffic they are getting. Some South Australian property developer and owner of the ipad apartment complex in Adelaide is having the traffic day of the life as owners of ipad.com.au. Take a look - screenshot below. Another change in the search industry hot on the heals of a hardware revolution. News sites buy keywords for breaking news stories all the time - I remember one that shall remain nameless doing it when Steve Irwin died in 2006 - if I remember right they got something like 15k clicks in an hour (at $0.5 per click). Tim, great post. i fear you are becoming a search dork (congrats and welcome to the club :-) ! given their progress and lack of competition, who's to say there approach isn't the right one?